Savory bread pudding is a special occasion dish I use for breakfast, lunch, and dinner. The prep is time-consuming and the cooking time a tad long, 90 minutes, but the results are worth the effort. This is a dish my children ask for again and again. It’s also a great centerpiece to a brunch buffet for friends and family. I typically use fresh garden vegetables, but, in the winter, frozen vegetables work fine too. Be sure to thaw and drain frozen veggies before using. Be creative and combine meats and vegetables you like. The recipe is forgiving as long as you don’t add too much liquid to the ingredients. Beat the eggs and milk together. Set aside. The three ingredients above are essential. The list below can vary and I’ve offered suggestions. 1 bunch of Swiss Chard (or kale, or collard greens, or 3-4 cups of spinach) roughly chopped. If using kale or collard greens, remove the stems. 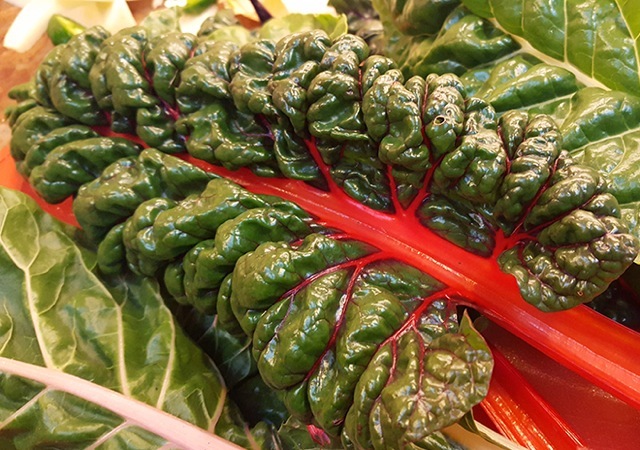 With the Swiss chard, you can include the stems. Thinly slice the Swiss chard stem that extends below the leaf. 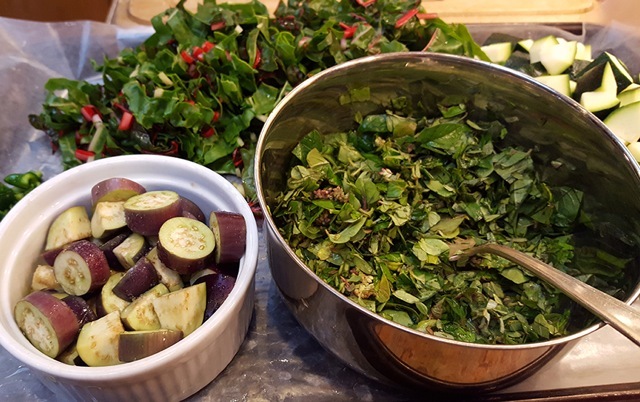 Place Swiss chard, asparagus, and zucchini (and eggplant if using) in a large bowl and microwave for 2-3 minutes until the vegetables begin to soften but are not cooked all the way through. 1 cup fresh mixed herbs: sage, basil, dill, marjoram, oregano (or whatever you can find). Mince herbs together. Dill and sage will be strong flavors so only use a little of each. If you can’t find fresh herbs, just add 1 tablespoon of Italian herb mix or even a tablespoon of Mrs. Dash no-salt spice mix. Add the minced herbs and 1 cup of the grated cheese to the microwaved vegetables and stir. Mix vegetables, cheese and herbs with the meat and onions and the cubed bread and put in a large, buttered, baking dish (a lasagna pan is perfect). Pour the egg and milk mixture over the bread mixture. The ingredients should be just covered by the eggs and milk. You may need to add more or even not use all the eggs and milk you mixed up. Bake at 350 degrees for an hour and thirty minutes. Set your timer for 60 minutes. When the timer goes off, add the remaining 1 cup of cheese to the top of the pudding. Cook for another thirty minutes. The pudding is done when a knife stuck in the center comes out “clean” (meaning no wet egg/milk on the knife when you remove it). Depending on the size of your pan, the pudding may take longer to cook. If you don’t have a lasagna or a 9×12 cake pan, you can split the pudding into several smaller pans. If you bake in smaller pans or ramekins, your cooking time will decrease. The cooked pudding freezes and reheats well.This is a bountiful recipe that easily feeds 6 to 8 people.